Hot air ballooning is becoming a very popular option on safaris in Africa. A hot air balloon ride truly gives you a “once in a lifetime” experience that will never be forgotten. It is so completely different to anything else you may have experienced before in both sensation and spectacle. 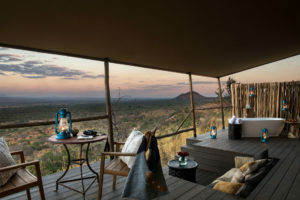 Combining this with the opportunity to explore the stunning African landscape and throw in some game viewing from close at hand and you have all the ingredients to a magical adventure. The ride is so quiet that it gives you the perfect opportunity to see animals up close and en masse due to the overhead perspective you get from a balloon. 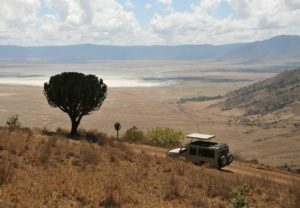 You can truly see for miles and miles and soak up the vastness of the African plains. With the only noise being the gentle hiss of the gas burners the peace and quiet gives you the chance to just enjoy the moment and marvel at all you can see before you. 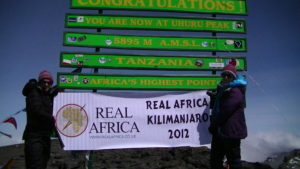 Most tour operators offer trips like this and they follow fairly similar schedules. They tend to start very early in the morning, usually before sunrise, when the air is at its coldest and therefore its calmest. You will be served tea or coffee while you wait and watch the balloonists prepare the hot air balloon for take-off. Once you take off up into the clear African sky you will gently drift across the plains with the prevailing winds. Your pilot will decide the height for flying as necessary and they will be able to drop lower for close up game viewing or rise up high over the tree canopies. The actual flight itself usually takes around an hour and when you land a ground crew will collect you and drive you back to the launch site where you will enjoy a full champagne breakfast. Then finally before heading back to your safari lodge or camp you will be awarded a certificate as a memento of your hot air balloon flight from the balloon pilot. In Kenya balloon flights are usually over the magnificent Masai Mara National Reserve. 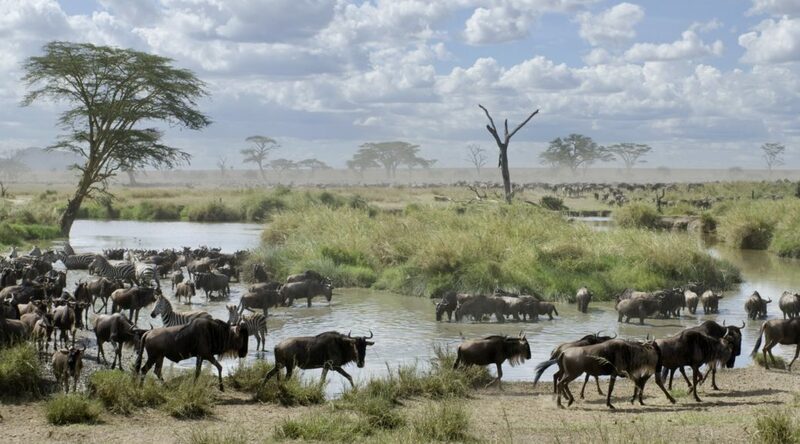 The Mara is the northernmost part of the spectacular Serengeti-Mara ecosystem, and is famous for being home to the awe-inspiring annual migration where millions of animals are on the move at the same time. The migration is a great time to go on a balloon trip as it gives you a great perspective on the size and speed of the migration that you just can’t get from the ground. The rest of the year is equally as good with scores of other wildlife on view including lions, cheetahs, elephants, rhinos, hippos, and crocodiles. 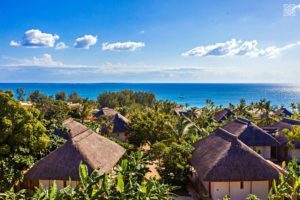 Also you can do hot air ballooning across Tanzania and the Serengeti and also South Africa; the Winelands, near Cape Town and over the Kruger National Park are some of the most popular options. 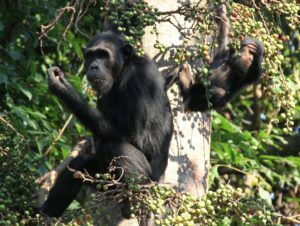 The plan to build a tarmac road through the Northern Serengeti National Park in Tanzania has been axed by the Tanzanian Government after a barrage of criticism from Conservation organizations. 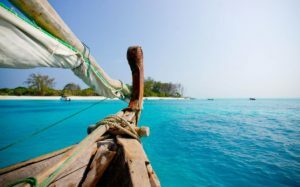 The Governments aim had been to connect the remote towns and communities near Lake Victoria, in the North West of the country, with the countries ports on its Indian Ocean coast. However the two lane highway was shown in studies to offer a serious threat to the indigenous wildlife, some estimates showing a reduction in wildebeest numbers from over 1 million to 300,000. This fall would have been caused by the creation of a tarmac barrier, as well as the volume of heavy vehicle expected to use the road. There was also the possibility of fences being erected which would have formed a physical block the animals could not have passed. 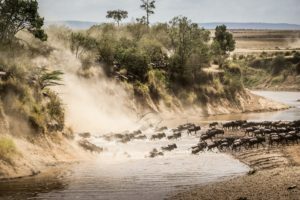 The wildebeest migration that happens every year between the Serengeti in Tanzania and the Masai Mara in Kenya is one of the greatest wildlife spectacles on earth, with over 1 and a half millions animals making the journey in search of fresh grazing. The migration is vital not only for the animals, but also for the landscape and grasslands which have been formed by the actions and movements of these animals for millennia. 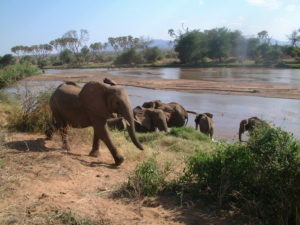 Many arguments for the diversion of the road were based on the importance of the Serengeti in tourism, one of the most vital industries in Tanzania. A visit to the Serengeti is a highlight of most Tanzanian safaris, its world-renown and excellent game-viewing based on its wide open grasslands and peaceful seclusion. The new road would threaten this and give poachers easy access to the main wildlife areas. 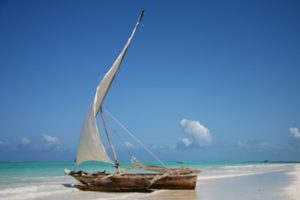 To balance this, the Government argued that the North Western areas were some of the poorest in Tanzania and the road was vital to help develop them. The southern, diverted road will be longer, but seems a sensible compromise that will help preserve this wonderful wildlife wilderness. The Serengeti is famous worldwide for its wide-open savannas and stunning wildlife, in particular its spectacular yearly migration of wildebeest and zebra. The park is a UNESCO world heritage site, and was recently listed as one of the Seven Wonders of the World. Covering 5,700 square miles, the park is the oldest reserve in Tanzania, having been established in 1951.The Serengeti National Park is located in northern Tanzania (near the border with Kenya) near Lake Manyara, Arusha, and Tarangire National Parks, as well as the Ngorongoro Conservation Area – this group of five reserves makes up what is known as the “northern safari circuit.” Quite a bit of controversy has surrounded the park’s history, in particular the fact that the Masai people living in the Serengeti were moved to Ngorongoro. 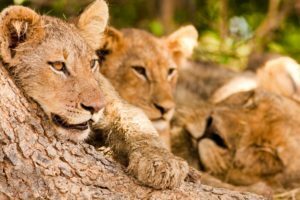 Despite this, the Tanzanian people feel an enormous amount of pride for this park, and it is one of the must-sees of the Tanzanian game parks. The terrain of the Serengeti is wild and open – indeed, with the exception of Tanzania National Parks (TANAPA) staff and researchers, no human habitation is allowed within the park. The park is a stunning mixture of savanna, grassland plains, and forests. Every year around October, millions of the park’s animals migrate to the Masai Mara in Kenya, making the return journey back to the Serengeti in April. The journey is an arduous one, exemplified by the fact that more than 200,000 wildebeests die while making the journey. Interestingly, the park remains home to one active volcano, called the Ol Doinyo Lengai – tree roots cannot penetrate the volcano’s ash, resulting in the treeless plains which stretch to the west of the volcano. The animals of the Serengeti are what have drawn visitors and adventurers to the park year after year. The array of beasts is spectacular: gazelles, buffaloes, elephants and lions are just a few of the animals visitors will see when visiting the park. There is a clear distinction in the park between the Serengeti’s predators and preys. Some of these predators are the most stunning of East Africa’s large mammals – golden lions, speedy leopards, and mischievous cheetahs all roam the park, feeding on gazelles and wildebeests. Visitors will also have the chance to view the over 90 variations of dung beetles that populate the park, as well as over 500 different species of birds. There is never shortage to see, and Serengeti travelers will find themselves on sensory overload from the moment they enter this renowned game reserve. Arriving at the Serengeti is not difficult; because of the park’s popularity, numerous safari tour operators are located in Arusha. Planes from Dar es Salaam to Arusha run daily. 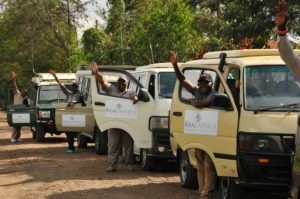 If you book with a safari operator before arriving in Tanzania, they can help you in making transportation arrangements. 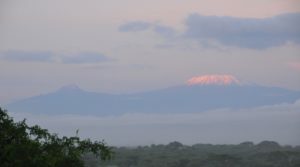 Arusha makes a great base for exploring both the Serengeti and a number of the other northern circuit parks. In order to see the great migrations, visit the park from December to July. However, if you are more interested in seeing predators, June to October is ideal. 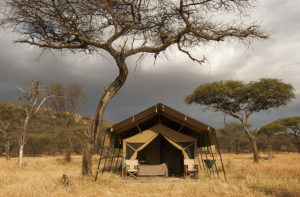 A number of camping sites, lodges, and luxury tents are located within the Serengeti, and to truly take advantage of your safari experience it makes the most sense to stay within the park. After all, there is nothing like waking up early for a morning walk and seeing lions roaming through plains as the sun comes up. Work with your tour operator to find your perfect accommodation. Check out the recently opened Billa Lodge, located within the park, which offers some fantastic package rates. 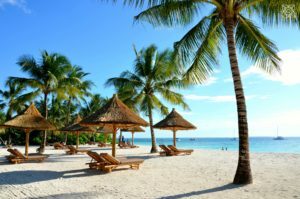 Discuss with your tour operator the type of accommodation you are interested in, as well are your budget restraints, and they will be able to find you exactly what you are looking for.